Video on social media is booming. More brands and businesses are using video on Facebook, Instagram, Twitter, LinkedIn, YouTube, and beyond—and consumers are eating it up. This guide breaks down everything you need to get started with social media video. According to our most recent State of Social Video trends report, video is consumers’ #1 favorite type of content to see from brands. And social media is the top reason marketers named for creating videos over the past year. We’ll show you how to get started with video on each of the major social platforms. Jump through to the different sections by clicking the links in the table of contents, or read through the entire guide for an overview of all things social video before you dive in and start to create social media videos for your business. Which social platforms should your business use? Social video is just what it sounds like—videos posted to social media platforms. Social videos are usually designed to drive engagement, including likes, comments, and shares, or to drive traffic back to your business. Videos may be posted organically (unpaid) or run as paid advertisements to a targeted audience. It’s important to note, however, that all social videos are not created equal, just as all social platforms are not created equal. What works for you on YouTube may not work on Twitter; what works on Instagram may not be ideal for LinkedIn. When it comes to social media, you’ll want to take a tailored approach to your video creation. That’s why we’ve broken our guide down to talk about Facebook, Instagram, LinkedIn, Twitter, and YouTube individually. For the CliffsNotes version, check out our cheat sheet on the types of videos your customers want on social media. Consumers have named video their favorite type of content to see from brands on social, but there are other benefits to posting videos on social sites as well. One of the biggest benefits is that social video, by nature, is shareable. Unlike the videos embedded on your website, users can easily like or favorite videos, share them, retweet them, comment on them, and more. Each like, share, or comment serves as an endorsement from one of your customers or followers that their friends or followers will see, putting your business in front of more eyeballs – it’s modern day Word of Mouth advertising. A whopping 93 percent of businesses say they’ve gotten a new customer thanks to a social video. And that isn’t all. 88 percent of marketers using video say they’re satisfied with the return on investment (ROI) of their social video marketing efforts. On Twitter, Tweets with video are 6X more likely to be retweeted than Tweets with photos. LinkedIn data shows that video is the most likely type of content to start conversations and is the fastest growing type of content. People gaze 5X longer at video content than static content in the Facebook and Instagram feeds. YouTube is the world’s second largest search engine. Your customers are searching for videos related to your business. Animoto’s Chief Video Officer, Jason Hsiao, says, “Today, trust is more important than ever for businesses of all sizes, and one of the best ways to get people to trust you is to humanize your brand and project an authentic version of yourself and your business.” He provides some tips for humanizing your brand in an article on 9 ways to build trust with video. 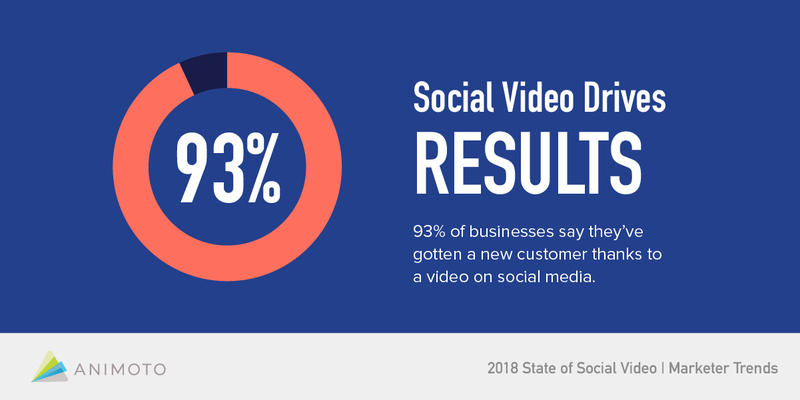 To learn more about the benefits of social video, check out our roundup of video marketing stats for 2019. If you’re just getting started with social video, you’re probably trying to decide where to focus your efforts. With Facebook, Instagram, LinkedIn, YouTube, Twitter, Snapchat, Pinterest, Google+, Tumblr, and more, the decision may feel overwhelming. The good news is, you don’t need to be everywhere. So how do you choose? Choose according to where your audience is and where you think you’ll get the biggest return on investment (ROI). 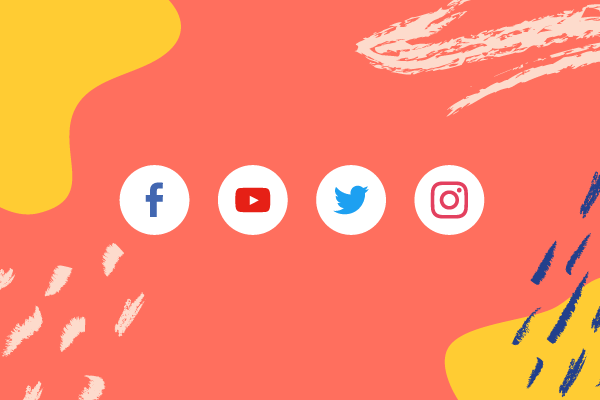 In the following sections, we’ll dive into five of the major social media platforms—Facebook, Instagram, LinkedIn, Twitter, and YouTube. We’ll explain the benefits of each platform, share a few video ideas and tips, and link out to more information. We think it’ll help you decide which platforms are right for your business. And if you need a little extra help deciding, join the Animoto Social Video Marketing Community on Facebook for advice from fellow video marketers and the Animoto team. Facebook has become an increasingly important platform for businesses. With over 1.5 billion daily and over 2 billion monthly active users on the site, your customers and potential customers are likely to be visiting Facebook on a pretty regular basis. Establishing a solid Facebook video strategy can help you reach them. How are Facebook users watching video? On Facebook, viewers are watching videos on the go. 88 percent are watching on a mobile device and 85 percent are watching without audio. They're heading to the app when they've got a few moments to spare and are scrolling to find out what's new. As a result, you’ll want to share videos about what’s new with your company. Facebook is a great place to share product updates, new deals, new locations, and other recent news related to your business to keep your followers in the know. What about people that aren’t following you, but may be interested in your business? Facebook Ads Manager offers targeting tools that can help you get your videos in front of the right people. Targeted video ads will show up in potential customers' News Feeds as they scroll. Learn more in our article on reaching new customers with targeted ads. As we mentioned in the previous section, Facebook is a good place to update your followers on what’s new with your business. Facebook also gives you the opportunity to reach new customers with targeted ads. These video ideas will focus on those areas. Each video idea is also a template that you can customize to make your own. You’ll notice that some of the templates are square and others are landscape. We recommend that when you create a video for Facebook you use the Aspect Ratio feature in Animoto to make all your videos square, since square videos stand out, taking up 78 percent more space in the News Feed. Showcase a special promo with our Seasonal Promotion video template. This video can be shared organically with your followers, or run as an ad targeting potential new customers interested in your industry or line of products. Share a brand new line of products or services with your Facebook fans and followers using our New Collection video template. Promote a new blog post or downloadable with a quick and easy teaser video. Provide enough information to pique viewers’ interest and provide a link for them to click through to read more. Get started with our Blog Teaser video template. Got an event coming up? Let people know, and encourage them to RSVP, with a video promo on Facebook. Get started with our Event Invitation template. As we’ve mentioned, different types of videos perform best on different platforms. We’ve talked about the type of content that performs well—current news and updates about your company, products, and services. But what works well from a video creation perspective? In this section we’ll share some tips to help you create videos that will stand out on Facebook. Plan for sound off. 85 percent of Facebook videos are watched without sound. Use text to make sure your videos can be understood whether or not viewers turn on the sound. Go square. Square videos take up 78 percent more space in the News Feed. Create square videos to stand out and entice more people to stop and watch. Use targeting. Use Facebook Ads Manager to get your videos in front of just the right audience. Target according to location, interests, and more. Start with something eye-catching. You only have a few seconds to catch people’s attention as they scroll through the feed. Start with an eye-catching photo or video clip, or text that surprises or makes people stop and think. Plan for mobile viewing. Most people on Facebook are watching on their mobile devices. Keep text and imagery large and simple to account for people watching on tiny screens. Preview your videos on a mobile device before posting. Looking to learn more about Facebook video? Check out all of our Facebook blog posts and find out even more about how to make Facebook videos with Animoto. According to Mention, a social media monitoring tool, Instagram video posts get more than 2X the engagement of Instagram image posts. Video on Instagram is taking off, and now is the time to get started. In this section we’ll dive into the Instagram audience and how to use video to reach them. This section will focus on videos posted in the Instagram feed. If you’re interested in learning about Instagram Stories, we’ve got you covered. Check out our Instagram Stories getting started guide. How are Instagram users watching video? Instagram viewers are similar to Facebook viewers, in that they’re scrolling on mobile, on the go, when they’ve got a moment to spare. But the type of content that resonates with them is of the inspirational variety. Instagram originated as a platform where photographers shared stunning photos. And, as a result, it’s the stunning, inspirational content that thrives. People are scanning the Instagram feed for content with compelling imagery, content that tells a story, inspires, or catches their eye. They’re also generally following people or hashtags related to their interests and hobbies. We’ve rounded up a few ideas for videos you can try on Instagram for the purposes of this guide. If you’re interested in more, check out our full blog post on Instagram video ideas for boosting engagement. Decide on a hashtag that’s relevant to your business and start a weekly series. This not only makes for a go-to video you can share once a week without having to think too much, but it also gives you the opportunity to get in front of people who are following that hashtag. In the Animoto Instagram account, we post regular #MotivationMonday posts. Think about the types of topics your target audience is into and do a bit of hashtag research to find a weekly video idea that’ll work for you. Use one of our quote video templates, such as Editorial Quote List, to create a video with inspirational quotes related to your industry. Share with relevant hashtags in the description or comments. Instagram ads are run through the Facebook Ads Manager. Use the same targeting methods to find just the right audience for your ads to sell your product or service in the Instagram feed. Think visual. We mentioned this in the previous section, but Instagram was originally a platform for photographers to share stunning photos. Although the app has grown to encompass much more, visually striking content is still king. So try to put your most compelling imagery up front in your videos. Keep it short. Videos in the Instagram feed can be up to 1 minute long. However, we recommend keeping your videos under 30 seconds, since viewers are scrolling through their feeds quickly and have short attention spans. Use hashtags. Hashtags are the key to getting your videos in front of a wider audience. Check out our article on Instagram growth hacking to learn more about how to effectively use hashtags in your Instagram videos. Set a cover image. Once your video is posted you won’t be able to go back and edit the cover image, so make sure you choose a good one when setting up your post. You can do this by clicking on "Cover" when setting up your video post. Want to learn more about using video on Instagram? Check out our complete Instagram video guide for everything from stats to video ideas, video specs, and more. You can also learn more about how to make Instagram videos with Animoto. On LinkedIn, video is growing faster than any other type of content. And because the ability to share native video is relatively new, now is the time to start using video to stand out. LinkedIn is home to the world’s largest professional audience, with more than 610 million users. It’s the prime social network for reaching decision-makers, opinion leaders, C-level executives and more. The audience makes LinkedIn a must for businesses that are targeting other businesses or selling products or services related to professional growth, as well as for recruiting. We’ve rounded up a list of LinkedIn business video ideas that you can check out on the blog. For the purposes of this guide, we’ll share a few of those ideas. You’re an expert in your field and video is a great way to showcase this expertise. Try creating video where you describe a current trend, comment on a trending news story, teach a skill, or share industry insights, as in the example below. Showcase your company culture and values to appeal to potential new hires. Check out our Company Values video template for inspiration. This template serves a dual purpose: it explains what your business does while also showcasing team values. Share a marketing video to promote your business, your product, an event, or a piece of content. Before you jump in and start creating, here are some best practices for LinkedIn video. Post native video. LinkedIn users have been able to upload videos natively to their profiles since August 2017, and last year they made this available to business pages too. Native video, uploaded directly to LinkedIn, gets more attention and shares than video links. Plan for sound off. Like Facebook, a majority of viewers on LinkedIn are watching with the sound off. Therefore, it’s important to use text to get your point across with or without audio. Capture attention quickly. Identify a problem or opportunity in the first few seconds to keep viewers watching. Provide a clear call to action (CTA). You want to make sure your viewers know what action you’d like them to take next. Do you want them to visit your website? Label the link clearly. Do you want them to sign up for a list? Watch another video? Make sure to give them a clear next step. Looking to dive in deeper on LinkedIn video? Check out all of our LinkedIn blog posts and find out how to get started with making LinkedIn videos with Animoto. Did you know that Tweets with video get 10X the engagement of those without? Video can help take your Twitter game to the next level. In this section, we’ll dive into how people are engaging with video on Twitter. Plus, we’ll share some social video ideas for Twitter, best practices, and let you know where you can learn more. How are Twitter users watching video? On Twitter, audiences are on the go, scrolling to discover on their mobile devices. This is similar to the audience on Instagram and Facebook. However, the content they’re scrolling for is a little bit different. On Twitter, viewers are interested in current events, news, and trends. They want to join in conversations around what’s happening right now. As a result, your video strategy should emphasize the things that are happening at the moment—trending topics, flash sales, and events that are about to occur. We’ll share a few ideas that should help you get the ball rolling when you’re ready to start making videos for Twitter. Our ideas are built around current trends as well as starting conversations. Create a video about a trending topic. Use related hashtags to get your video in front of the broadest audience. Here’s an example from Jane Goodall Institute’s Roots and Shoots. The video was shared with the hashtag #InternationalPrimateDay. Create a short video about a new blog post, downloadable, or other type of content. Give viewers just enough information to pique their interest and encourage them to click a link to learn more. For help getting started, check out our Blog Teaser or Content Teaser template. To help make the most out of your social video efforts on Twitter, we’ve put together a quick list of Twitter video tips. Plan for mobile viewing. 93 percent of Twitter video viewers are on mobile. So keep text, captions, or subtitles large enough to be legible on a small screen. Repurpose content. Twitter videos are ephemeral. They only stay in the feed for a short amount of time. So use what you have to create your videos. This’ll make it easier to create content quickly. If you don’t have assets, check out our Getty Images library of photos and video clips. Include a call to action (CTA). Make sure people know what to do after they watch your video. Include a link for more information, encourage people to buy now, respond, share, or whatever action you want them to take. Use hashtags. Like with Instagram, hashtags are your key to getting your video in front of the broadest audience. So be sure to include hashtags related to your industry or the topics you are sharing videos about. If you’re interested in learning more about using social videos on Twitter, check out our complete guide to Twitter video. Ready to dive in? Learn how to make videos for Twitter using Animoto. YouTube is a bit different than the other platforms we’ve talked about. It’s not only a social media site, but it’s also a search engine. And it’s got over one billion users in 91 countries and 80 languages, which means the odds that your customers are on YouTube are incredibly good. In this section, we’ll take a look at how YouTube users are watching and searching. We’ll also share some video ideas and best practices to help you get started. How are YouTube users watching video? Your potential customers are actively searching for everything from how-tos to product reviews on YouTube. Social videos on other platforms are showing up randomly in viewers’ feeds. But on YouTube, people are searching for specific content. This means that they’re more engaged, they are watching with sound, and they are willing and eager to watch longer form videos. In this guide, we’ll share a few ideas for YouTube videos you can start out with. If you’re interested in more, check out our list of 21 YouTube video ideas. First things first, you’ll need an intro video that shows who you are and what you or your business is about. You can make this the channel trailer on your YouTube channel so that new visitors can learn more about you. As defined in our explainer video guide, an explainer video is “a video that explains a concept, your business, or an aspect of your business, in a way that’s easy to understand.” Think about the concepts your potential customers may be searching for and then explain them in a video. This example explains the answer to a common question in the world of real estate: how do I price my house? When your potential customers are searching for videos about how to do things related to your business, you should be there to answer their questions. Create a how-to video to get on these viewers’ radar. According to Think with Google, over 50,000 years worth of product review videos have been watched in the past two years. Uploading a positive customer review video means that when your customers search for reviews of your product, you’ll be there to help tell the story. Ready to dive in? Here are a few tips to keep in mind as you start creating and posting videos to your YouTube channel. Keep your audience in mind. Who are you trying to reach? Put yourself in their shoes and think about what they’re interested in, what they’re searching for, and how they’re searching for it. Optimize your videos for search. When you upload a video, make sure to fill out the title, description, and tags fields so that viewers can find your videos. Think about the terms your customers are searching for when looking for businesses like yours and include those keywords. Use an enticing thumbnail. The thumbnail is the first thing potential viewers will notice when they’re searching for videos to watch. Choose a thumbnail that captures attention. Hook in the first 15 seconds. Provide value up front in your video or you’ll lose your viewer. Once you’ve hooked your viewer, continue to provide value throughout the entire video. End with a strong call to action. Let viewers know what you want them to do next. Remember that you can include links within the description of your video and let people know they’re there in your video. Looking to learn more? We’ve got a complete guide to YouTube marketing. Check that out and learn more about how to make videos for YouTube with Animoto. What are your goals for social video? In this section, we’ll take a look at popular objectives for social video marketing to give you all the information you need to start setting your goals and building your social video strategy. 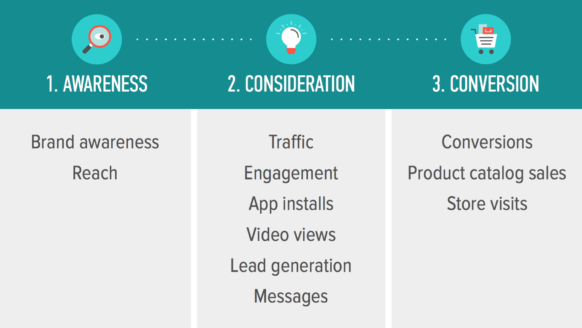 Your goals for social video should be two fold. Of course, you’ll have goals relating to the results you want to get out of your video campaigns themselves, which we’ll dive into in a second. But first, if you’re just getting started with social video, we’d also recommend setting some light weight goals for yourself, simply around diving in! Is there a specific number of videos you’d like to try posting this month? This year? Do you want to allot a certain amount of time each week to focus on social videos? Come up with one or two super tangible goals that you can set to hold yourself accountable as you start using video on social media. Once you’ve set your more general goals for social video, it’s time to start thinking about what results you want to drive with your social video efforts. It can be easy to fall into the trap of simply posting to social for the sake of it. But it’s important to ask yourself: What action or actions do you want your video initiatives to convince viewers to take? The answer to this question will likely fall into the first three stages of the customer journey: awareness, consideration, or conversion. Not familiar with these stages of the customer journey? We’ll break them down for you, along with some popular advertising objectives tied to them. You’ll recognize these objectives when you head over to Facebook Ads Manager to set up your Facebook and Instagram ad campaigns, and you’ll find similar objectives when setting up ads for all the different social platforms. Awareness lies at the very top of the marketing funnel. This is the stage where you’re getting your product or service on the radar of potential customers who may not yet know who you are or what you do. This is your opportunity to start building a relationship without directly selling. Brand awareness is all about reaching folks that are likely to remember your video and your brand. Reach is about getting your video seen by the largest number of people. During this stage of the customer journey you’ll want to share content that is interesting, educational, inspiring, or entertaining. You can indicate what your product is and share its value, but don’t dive too deep into specifics. Instead, share content that’ll peak the interest of potential customers without the hard sell. This share-worthy video from Nu Era Bakery in West Virginia is a great example of content that drives awareness through telling an interesting story about a product, rather than selling the product. This isn’t an ad—it’s a content piece about the history of pepperoni rolls. But it succeeded in piquing enough interest in Nu Era’s pepperoni rolls from around the country that the shop decided to start shipping! Read their case study here. This case study inspired our Product Story video template, which you customize to tell your own product story. Consideration is a little further along in the customer journey. The customer is familiar with your brand by now. This is where you want them to start thinking more about you and looking for information related to your products or services. Facebook defines objectives in the consideration category as those that “get people to start thinking about your business and look for more information about it.” These include traffic, engagement, video views, lead generation, and messages. In other words, unlike the awareness objectives, which just strive to get your brand in front of folks, these objectives aim to have viewers actually take some action, outside of actual sales. You still don’t want to be too direct with your sale when targeting customers in the consideration phase of the customer journey. However, you can dive a bit deeper into your product or service. Be educational and helpful and create content that’s tailored to specific questions customers may have when looking for more information about your business, or looking for information about a question that your business can help them with. Boutique floral designer Jill Gaynor created this how-to video about creating a floral gift box. By featuring her expertise, she’s not only gained exposure to thousands of new potential customers, but she’s been able to showcase her own work as well for customers in the consideration phase. Thanks to her how-to videos, Jill was able to land a number of corporate clients. Read more about this case study here. Want to create a video like this? Check out our DIY: Beauty Tutorial, Expert How-To, and Step-by-Step video templates. When customers get to the conversion stage of their journey, they already know who you are, what you do, and have done their research to find out any open questions they had. Now is the time to convince them to purchase or subscribe. In this stage you can share content that really focuses on your product or service, showing off the benefits and including a call to action to buy. You can create a sense of urgency by including a limited-time offer, as digital graphics provider photoDuds did in this video ad, which resulted in over $1,000 in sales. Read the full case study here. If you’re looking to create a video ad, try our Bite-sized Product Intro video template on for size! Remember that you don’t have to choose just one objective, but keeping a tight focus will allow you to spend your time really optimizing your social video strategy to achieve the desired results. And when it comes to creating individual videos, each one should focus on a specific objective in order to drive the best results. Some videos should drive awareness; some videos should drive engagement and views; and, of course, some videos should drive sales. But videos should be concise and when you try to do too much with one video, you may end up confusing your audience with what action you want them to take. In the next section, we’ll dive in deeper on how to set measurable goals to set yourself up for success—and how to see if you’ve achieved them! Once you’ve determined your social video marketing objectives, you’ll need to figure out how you’re going to measure whether or not you were successful in achieving your goals. In this section, we’ll dive into some tips for measuring results, including how to phrase your objectives so that it will be clear what you’re measuring and some tools you can use to help you analyze the success of your social video campaigns. First things first, you’ll need to make sure you’re setting goals and objectives that are actually measurable. In our last section, we went through a list of objectives, including driving brand awareness, engagement, sales, and more. But in order to figure out if you’ve been successful you need to tie numbers, as well as dates, to each of your goals. If your goal is to increase traffic to your website, how much do you want to increase traffic and by when? "Drive more traffic to my website" is not a measurable goal, but "Use video to drive at least 500 new website visits each month" definitely is. You’ll be able to track how many people visited your website as a result of your video campaigns and check in on a monthly basis to see how you’re doing. You may want to choose to set monthly goals, yearly goals, or a combination of both. When you’re just starting out with social video marketing you may have no concept of how much traffic a video can drive to your website or how many people you can reach with $50 ad spend. That’s ok! You’ll learn these things as you go, and it’s totally fine to start with some simple goals to begin with. Perhaps your objective is simply to run one Facebook video ad each month with the sole intention of learning. As you get more experienced, you can start setting more advanced goals. It’s important to note that every video you make won’t be a success, and that’s ok! In fact, it would be surprising if it was. You’ll learn from the videos that don’t perform as well, try new things, and, over time, figure out what works best for your particular business. That’s why you’ll want to be sure to distinguish between your goals for specific videos and campaigns and your goals for your social video marketing initiatives as a whole. So how do you actually measure success? Luckily there are a number of powerful (and free) tools you can use. We’ll take a quick look at Facebook Insights, Facebook Ads Manager, Google Analytics, and a few of our favorite task management tools. Facebook Insights is Facebook’s built-in analytics tool. It breaks down the data on individual posts, as well as your page overall, and includes everything from information on post engagements to video views, reach, page views, and more. You can access Insights by clicking at the top of your Facebook page when logged in to Facebook’s Business Manager. You can learn how to get started in Facebook’s Help Center. You can get next-level insights by installing the Facebook pixel on your website. Installing a snippet of code will allow you to see what happened on your website as a direct result of your ad and more. You’ll set your ads up in Facebook Ads Manager, but the fun doesn’t end there. Ads Manager offers real time reporting tools that’ll show you whether your ads are driving their intended goal, which means you can pause them if they aren’t or choose to put more money behind them if they are. You can also check out performance trends over time in order to maximize your Facebook advertising spend. Learn more on Facebook. Google Analytics is a wonderful tool that can help you track your social video efforts as well. It’ll show you how much traffic comes to your website via social and, using UTM codes you can get an even deeper understanding of how specific posts are performing. UTM codes are bits of text added to your URLs or links that will tell Google Analytics where traffic was directed from. So when you create a Facebook Ad, or simply post a video organically with a link included, you should add UTM parameters in order to check how many clicks come through as a result of your video efforts, and what other actions those clicks are resulting in. Buffer’s Complete Guide to UTM Codes is a great resource for getting started with UTMs. Finally, for your objectives that are more task-based, like creating at least 1 video per month, a task management tool can be helpful for staying accountable. There are a huge number of free task management tools out there. A few of our favorites include Wunderlist (it plays a great "ding!" sound whenever you check off a task) and Trello. Each social platform has its own Insights that you can dive into to determine how your videos are performing. To learn more, check out the guides linked to from each of our platform sections. We hope you've enjoyed this overview of all things social video. By now you should have a good sense of which social platforms you want to focus on and have some ideas for videos. We're here to help you take the next step. An Animoto subscription gives you everything you need to drag and drop your way to powerful and professional social videos. With customizable video templates, designed with social media success in mind, you can create your own videos in minutes. With over a decade in the industry and partnerships with YouTube, Twitter, Facebook, Instagram, and LinkedIn, Animoto is used by more than 1 million businesses worldwide. Try it for free today or learn more about using Animoto for social videos. Happy video making!